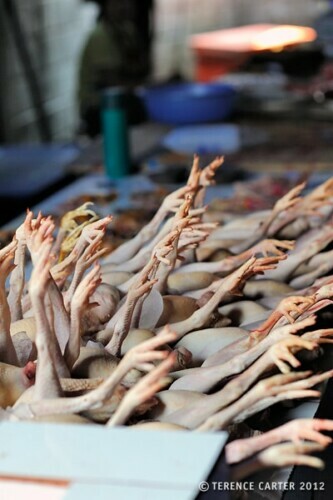 It’s safe to say that Lao cuisine is not known very well outside Southeast Asia — unlike Thai and Vietnamese cuisines. Lao food hasn’t reached the level of popularity — and ubiquity — that other Southeast Asian cuisines have in the West. Laos cuisine has stayed as mysterious as the country itself — which is exactly why we were keen to learn more about it. 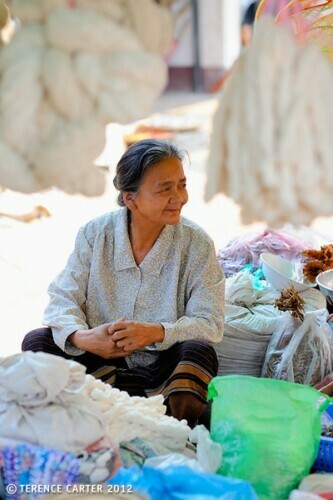 Now that Laos is a firm favourite on the traveller’s circuit of Southeast Asia and Luang Prabang its meeting point as a first or final destination for many travellers, Lao cuisine or Laotian cuisine has a chance to win over those who usually return home saying that they now love Thai food or they’re smitten with Vietnamese. Finding the Lao cuisine that we’d read about, however, proved to be a little bit more difficult in Luang Prabang than we had evisaged. In the restaurants around town there is plenty of French food, Thai, and generic Western or ‘international’ food, but there are few eateries focused on dishing up traditional — and dare I say it, authentic — recipes of Lao cuisine. So we did what we usually do, we sought some expert local advice. 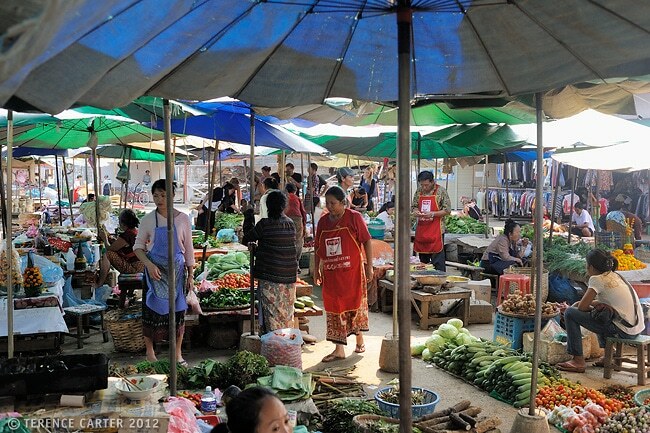 Luang Prabang Market Tour and Lao Cooking Class at Tamarind. One of the first things we do when we arrive somewhere new is seek out someone who has a reputation for knowing the local cuisine. In the case of Luang Prabang, it was Joy Ngeuamboupha of Tamarind restaurant. A novice monk, DJ, and bartender before he became a chef, Joy opened Tamarind six years ago with his Australian wife Caroline, and started his cooking school soon after. We joined Joy for a morning market tour and cooking class. “Lao cuisine is bitter, spicy, sour, and salty, not sweet,” Joy tells us emphatically as we arrive at Luang Prabang’s Phousi Market. The market is just starting to quieten down after a busy morning. Business begins here around 4am. Vendors are alternately vying for attention of late shoppers or already counting their money from the morning’s takings. “Laos have only started to use more sugar and coconut cream since tourists have been coming,” Joy reveals, somewhat dismayed at the prospect. “Traditionally, Laos use lots of herbs,” he says, gesturing at the plethora of aromatic greens at the little one-woman herb stand we stop at. Northern Lao people, according to Joy, use much more herbs than they do in the south and things from the forest, like mushrooms, the favourite being cloud ear mushrooms which are often used in orlarm, a quintessential Luang Prabang stew. 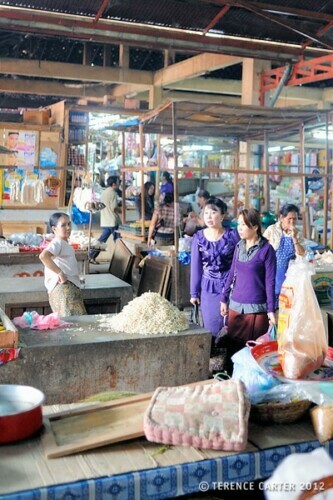 Southern Lao food is more like Thai cuisine, sweeter and spicier. Steaming and grilling are common cooking methods. The herbs used in Lao cooking are similar to Thai, but often have subtle differences like the local basil called pak itou which is close to Thai holy basil, but has a slightly more aniseed flavour. Lao mint, similarly, is milder than Vietnamese mint, and the local Lao limes are a cross between a lime and a lemon. Another often-used ingredient is dill or phak see, which is known as Laotian coriander (cilantro for North Americans). Its use is particularly notable in the classic Lao dish mok pa, steamed fish in banana leaves. Eggplant (aubergine) is also used in Lao cooking, both the small round eggplants (the ones Westerners often leave behind in their bowls of Thai curry!) and the long thin eggplants with a similar texture to those found in the Mediterranean and the Middle East. 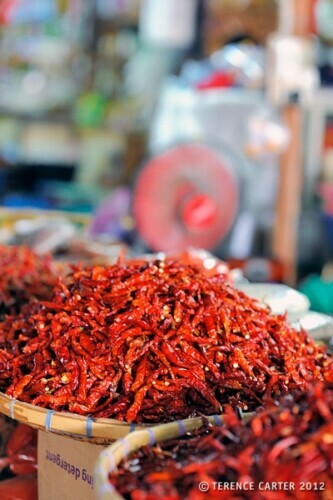 They’re used in the popular jeow mak keua, a smoky eggplant dip or relish, as well as in the Luang Prabang stew. We stop to sample some local specialties. 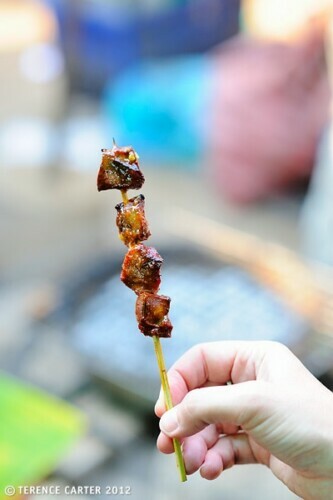 The sticky rice we try is similar to that found in northern Thailand, but for sure we’ve never had BBQ buffalo, tongue, heart and skin there before. Buffalo, which graze beside the Mekong River, is a big feature of Luang Prabang cuisine, and we’ll try it in many meals during our stay. There are other oddities in the market, such as dried squirrel, used in squirrel stew, and dried ‘seaweed’, which is actually Mekong River Weed, a crispy snack which turns out to be very tasty. There are also some aromas we can’t identify — things are fermenting all over the market! There is beautiful fresh produce in abundance that we are familiar with: chillies, kaffir limes, snake beans, basil, coriander, shallots, and those eggplants. Shiny tomatoes are plentiful and they’re important to Lao cuisine as well, being the key ingredient of a fantastic Lao salsa called jeow mak len. With many dishes, particularly salsas and dips, vegetables are grilled over an open (generally charcoal) flame, before being pounded in a mortar and pestle — one of the most important utensils in a Lao kitchen. The result is generally eaten by dipping little balls of sticky rice into the salsa — the amount you put on each mouthful being dependent upon the heat! It’s hard to convey just how important sticky rice is to Lao cuisine. You certainly get an understanding when you see sacks of different types of rice being sold at stall after stall at a market such as this. It’s practically the only rice people eat in Laos — aside from well-touristed places like Luang Prabang, where Thai and Chinese influences have seen regular white rice appear with curries. Most dishes, like jeow mak len and jeow mak keua (the smoky eggplant dip) are made to be eaten with sticky rice. While sticky rice is dipped into stews as well, it’s often an ingredient of the stew too, being burned over an open flame before being added to the dish. And dessert doesn’t count unless there is sticky rice — the purple variety is used with a delicious coconut sauce in the ubiquitous khao gam. As we continue our walking tour around the market, our attention is soon drawn to a couple of things. 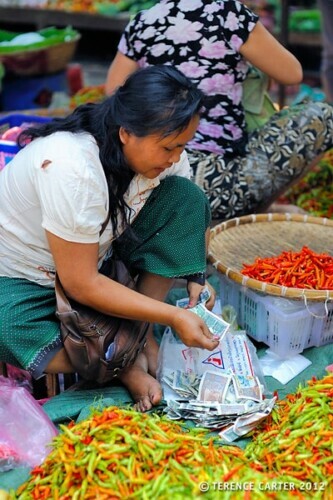 Firstly, we see women inspecting stacks of wood, which in the West you would assume to be for firewood, but is actually sakhan, often called chilli wood or pepper wood, used in the classic Luang Prabang stew. This, and some of the other ingredients used in the stew, such as rattan shoots and buffalo skin, aren’t so readily available outside of Laos, so take the opportunity to try the dish when you’re in Luang Prabang. Another thing we notice is how fussy some customers are about selecting their lemongrass. The reason is a Lao dish called ua si khai — stuffed lemongrass. 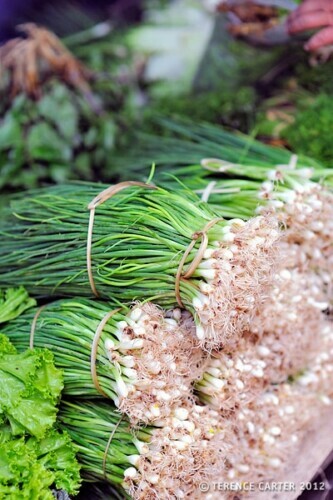 With this dish, as we’ll learn in Joy’s cooking class, you need to delicately slice through the centre of the stalk of lemongrass to create a ‘basket’ in which to stuff a combination of herbs and minced protein (usually chicken, beef or pork), before frying it in a wok. It’s another must-try Lao dish. Great pictures and thanks for the detailed descriptions! The recipes sound amazing, definitely have to add Luang Prabang to my list of places to see – just so I can get stuck in to the foody delights. Thanks Vicky, definitely a must in South East Asia. Its been over 10 years since I visited Laos…reading this article reminds me of how much I’d like to return. I hope 2014’s the year! You must return! It’s a lovely little country. 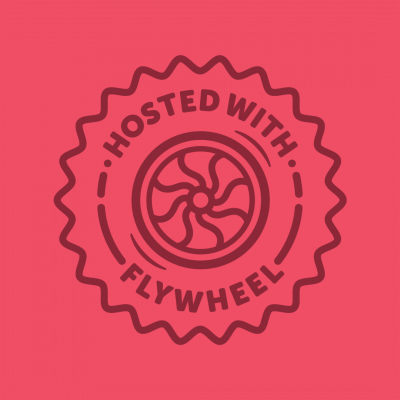 Come back and tell us how your trip is after you’ve been.